Since 2005, Mt. Hood Outfitters has operated as the primary resource for outdoor adventure in the Government Camp area and in the Mt. Hood National Forest. The outfitter guide company began when it acquired the only permit to operate snowmobile tours in the Mt. Hood National Forest. In 2005, its main services consisted of guided snowmobile tours in the winter and hiking tours in the summer. Greg Moreno, locally known as “Chopper”, has been the operator and lead guide for the company since it first began. Each year the number of customers has grown along with additional activities being offered. 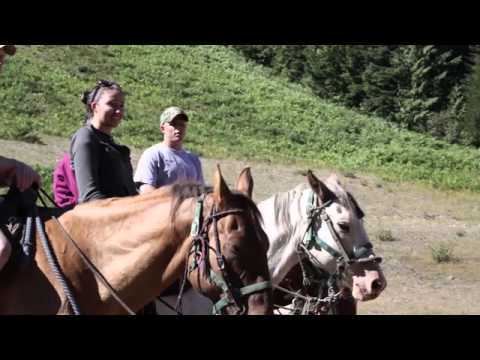 In the summer, Chopper and his crew now offer backpacking trips, mountain biking, rock climbing, canoeing, kayaking, stand-up paddle boarding, horseback riding, horse packing, whitewater rafting and fishing in addition to their hiking tours. Once the snow comes in late fall, they begin to transition over into the winter activities, which now consist of snowshoeing and cross-country skiing in conjunction with the featured snowmobiling. Between 2007 and 2010, Mt. Hood Outfitters operated as an official Clackamas County Visitors Center. It has always been the staff’s forte to be extremely knowledgeable about the area’s history, culture, wildlife, plant life, trails and activities. Being able to showcase the area as a visitor’s center was very enjoyable for the staff, but in 2010 the funding from the county was pulled. Though they are no longer an official visitor center for Clackamas County, they have continued to increase these types of services offered, by providing maps, brochures and more on the area and the things to do around Mt. Hood. Mt. Hood Outfitters is truly the mountain’s recreational concierge! “All of our tours are interpretive as we learn about Mt. Hood’s history, geology, cultures, flora, fauna and much more. If you prefer to head out on your own, we will point you in the right direction with the right gear,” says guide Greg Moreno. As the company developed, they now offer a full array of rental equipment and retail so that getting the right gear to properly enjoy the activities in the area is easy and convenient. From kids to grandparents, Mt. Hood Outfitters will continue to serve as their recreation specialist, guide and outfitter for the Mt. Hood area for years to come.